"Michael will have your audience rolling with laughter while appreciating their Catholic Faith in a way that no other speaker can!" Michael Cumbie now offers talks on the The Divine Mercy (St Faustina's Diary) and the devotion to the Divine Mercy. He is also a lay associate member of the Marians of the Immaculate Conceptions and offer these talks as well. Learn more about this DVD Set. From the heart of the Deep South, steeped in Southern Baptist tradition Michael Cumbie's call from God to preach the Gospel came at age 14. At age 19, while attending college and working on a degree in Music Education Michael experienced a life changing charismatic encounter with the Holy Spirit. Increasingly dissatisfied with fundamentalist, evangelical preaching of the Gospel, he began to understand just exactly how the early church had worshiped with its signs and symbols - and its focus on the Eucharist. Although a Protestant Pastor for 23 years, Michael ultimately realized that to be truly in one accord with "ancient historic" Christian practice, means to be in union with Rome, where the chair of the successor of St. Peter is located, he continued his studies and research. Michael was even ordained to the sacred priesthood (see picture gallery 2) with an "old catholic" group in 1993. Eventually he realized that his denomination and the Roman Catholic Church would not become one any time soon, and he discovered that this quest for the fullness of Faith could only be realized in the Roman Catholic Church. In 2001, Michael and his three children were received into the Catholic Church. 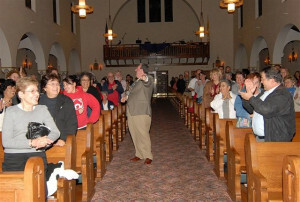 Michael's wife Sherry came back to the Catholic Church that day as well, after a 28-year absence. Michael Cumbie's conversion story is entitled "No Bread on the Table, No Crumbs on the Floor" because of his great love of, and respect for the Most Holy Eucharist. Michael Cumbie is an experienced speaker, musician and worship leader and will inspire any audience with his knowledge, wit and incredible sense of humor. Michael Cumbie wants to speak at your Parish!! “I have learned more in the past four days than I did throughout my entire RCIA course. Michael has taught us and explained things that I haven't been able to get answers too. 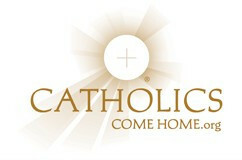 Catholics Come Home is a website to help you begin or continue your faith journey, so you can find true peace, happiness and purpose in life.